DR. JOHN — GRIS GRIS GUMBO YA YA – IS YOUR CLAM IN A JAM? Mac Rebennack started his career as a studio musician in LA in the early 60s working for Sonny & Cher, Frank Zappa’s Mothers of Invention and Canned Heat. Originally from New Orleans he’d always been fascinated with his hometown’s Voodoo/Hoodoo history. 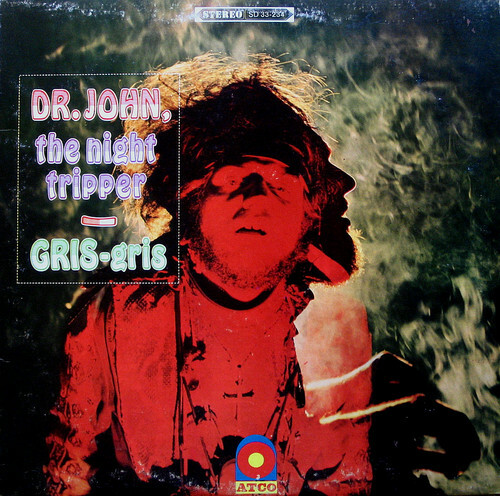 In 1968 he took up the monicker Dr John The Night Tripper, after Dr John Creaux, an infamous voodoo prince and started fusing New Orleans R&B with psychedelic rock and blues. Here is the first track from his debut album, a broody psychedelic number in which he introduces himself and his dark practice. Imagine a misty swamp at night, with a small island in the middle. On this island there’s a cauldron that’s boiling with a potion brewing. Behind it there is a throne that stands between two flaming torches. On this throne, made of bones with crocodile heads and snakes as armrests, wearing a top hat, there’s Dr John, known as a night tripper, stirring the potion that will make your troubles go. You know that what he’s got is what you need.